Deepika Padukone had a fruitful year with Padmaavat topping the charts to her lavish wedding with Ranveer Singh. 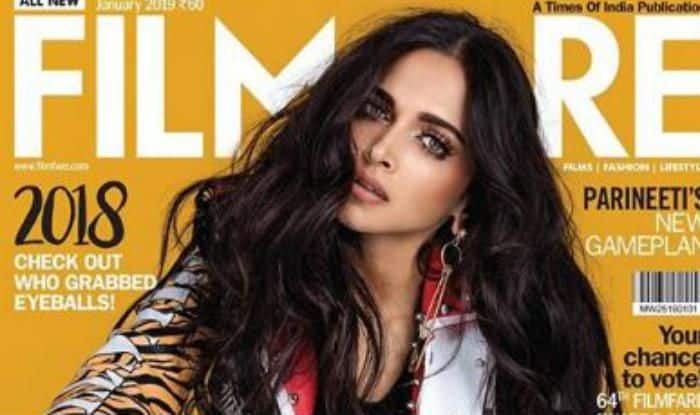 Now, she is starting 2019 by being featured on the cover of January issue of Filmfare. Earlier today, she took to Instagram to share the cover picture with her fans and we must tell you that she definitely knows how to grab eyeballs. In the picture, she is looking fabulous in black and red printed top teamed up with leopard print funky jacket. A pair of earrings, kohled eyes, subtle makeup and red high heels makes her look like a boss lady. One element in the picture that took our attention is her diamond-studded wedding ring. As per the cover, she is the newsmaker of the year and for all the right reasons. This is not the first time that she has appeared on the cover of a magazine. Earlier, she became the talk of the town when she featured on GQ’s cover. In the cover picture, Deepika was seen channelling her inner diva dressed in a deep purple halter neck top, black leather pants and a black head scarf. It has been an eventful year for Deepika, who tied the knot with Ranveer on November 14 and 15 this year. She is one of the highest paid actresses in India, and the recipient of several awards, including three Filmfare Awards. Apart from being one of the nation’s most popular personalities, she was also named by Time magazine as one of the 100 most influential people in the world in 2018. Deepika has starred in a number of movies, with 2007 movie Om Shanti Om earning her the Filmfare Award for Best Female Debut. She established herself in Bollywood with movies like Yeh Jawaani Hai Deewani, Chennai Express, Happy New Year, Goliyon Ki Raasleela Ram-Leela, Piku, Bajirao Mastani and Padmaavat.